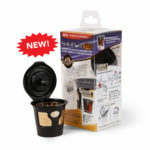 First, must mention this is a great refillable KCup pod, made with sturdy materials. Comes apart for easy cleaning, all is indicated on packaging. Three adjustments for coffee strength. Unfortunately, it does not mention that you must remove a part to use with Keurig K155. Here are the steps how to use. Enjoy! I wanted to say that Solofil is a good company. When I ordered their new K4 gold plated reusable filter, there is a leak on the side of the lip of the cup. I reported the problem and I thought I just needed to replace the O ring sealer. I was surprised because I thought they will just replaced the O ring but they sent me a new K4 filter in first class mail. This is a good quality filter compared to others. You can leave the auto tamping on light setting and just do a couple of tap, it will do the same thing, you will get a good brew of coffee. If you prefer without self tamping, check out their Solofil K3 filter.